I really like the detailing of the “post base with steel rod and washer” and was wondering what the minimum size post is for this installation. I have been considering 4×4 posts but it seems that might not leave enough meat on the sides of the mortise. Thanks! Hi Steven, thank you for your question. The short answer is that 6×6 is typically the smallest practical size, but it usually depends on the loads you are trying to resolve. The loads often dictate that a 8×8 is necessary (or larger). This is a good connection to use if you expect the post to have uplift loads from wind or seismic (depending on how your framing ties into the post). We often use this connection for porches, sheds, and posts along the exterior of the structure, which usually require larger posts to begin with. We typically use 7/8” threaded rods, which we drill-and-epoxy into the concrete foundation. You need to subtract the area of the drilling out of the area of the plate to find the actual bearing that you will have in your post. 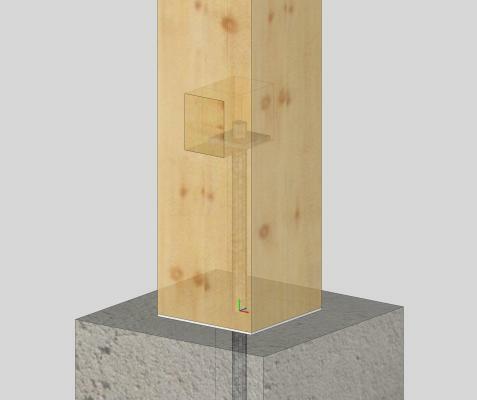 If you are using a typical SPF #2 6×6 S4S post (real dimensions 5 ½”x5 ½”) and you are resisting ~1000 lbs of uplift, the allowable compressive stress in the post is 425 psi (AWC NDS Supplement Table 4D). So, if you divide your load by your allowable stress, you can find a required plate area of: 1000/425=2.35 in2. A 2”x2” plate minus the 7/8” drilling ~3.2 in2, so you are all set. We typically over-mortise by ¼” (1/8” per side) so we can actually get the plate into position, so your mortise will be 2 ¼” wide, and extend from one side to 1 1/8” past the center. This will leave you 1 5/8” of material on the back side, and 1 5/8” of material on the two sides, which should be sufficient for small residential loads. The 4×4 would then definitely be too small.